The University's pioneering contribution to optical fibre technology was recognised. 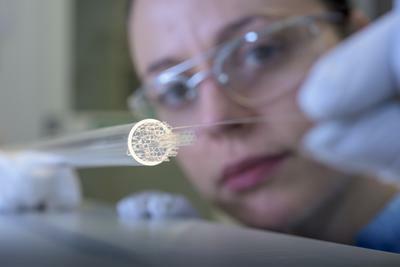 The University of Southampton’s pioneering contribution to optical fibre technology that now enables the internet to span the world has today been named as one of the UK’s 100 best breakthroughs for its significant impact on people’s everyday lives. The ingenuity of Southampton Professor Sir David Payne and the University’s world-leading Optoelctronics Research Centre (ORC) is honoured to join the UK’s Best Breakthroughs list of the last century. The list of breakthroughs demonstrates how UK universities are at the forefront of some of the world’s most important discoveries, innovations and social initiatives, transforming lives in the UK and around the world. Fifty years ago, the ORC received global recognition for inventing one of the world’s first ultra-low loss optical fibres before pioneering the fibre amplifier that enabled the internet to span the world. This inspired innovation was recognised by the Queen’s Anniversary Prize for Higher and Further Education last year. Today, ORC optical fibre inventions navigate airliners, cut steel and are found on the moon, Mars and International Space Station. And now, through the development of hollow-core fibres – the next generation of optical fibres– the ORC is bringing data transmission rates within touching distance of the speed of light. 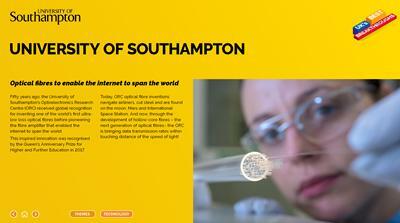 More information about the UK’s Best Breakthroughs and the MadeAtUni campaign is available online.